UFC 229 promises to be the highlight of the 2018 fight season. 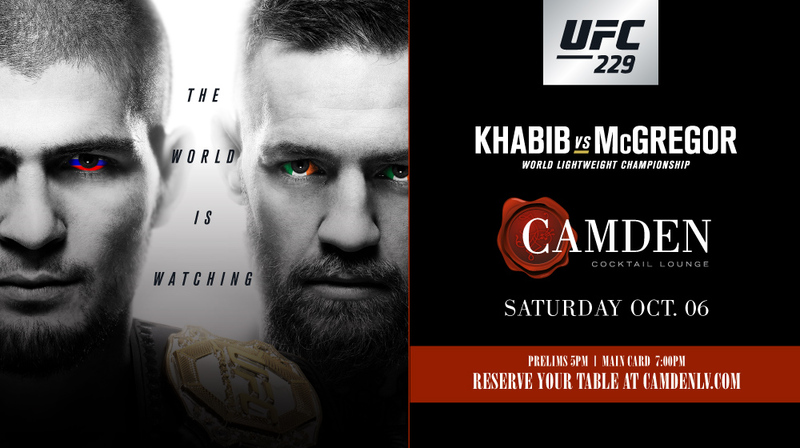 On Saturday, October 6th, we’ll be hosting a special viewing party here at Camden Cocktail Lounge, so you can watch UFC 229 in a great atmosphere while enjoying delicious food and cocktails. And, of course, all eyes will be on our many flatscreen TVs as we watch history play out, live. UFC 229 is perhaps the most anticipated match of the season. With a projected 2.5 million pay-per-view buys, much of the attention surrounding this fight is due to the long leadup and history between the fighters. When Conor McGregor and Khabib Nurmagomedov square off on October 6th, they’ll be settling a five-year-long rivalry. McGregor, who is the highest-paid athlete in UFC history, is known for his fiery attitude. He’s also coming back from spending nearly two years away from UFC; his last fight was in November of 2016 when he won the lightweight championship. Tensions between McGregor and Nurmagomedov came to a head when McGregor threw a metal dolly at Nurmagomedov’s bus last April. McGregor was charged with three counts of assault. Part of what makes this fight so captivating is the fact that the boxers are so closely matched. Nurmagomedov, the current UFC lightweight champion, has 26 wins. McGregor has 21 wins and 3 losses, and his striking style will be in contrast to Nurmagomedov’s grappling style. McGregor has already made his own predictions about the fight’s outcome, stating that Nurmagomedov has a “glass jaw” and that McGregor will win the match within one round. “I know he is afraid of smack. And if you’re afraid of a smack off me, a smack will feel like a double-barrelled shotgun. So I believe inside the first. But, I have been wrong before. I will be prepared for five rounds,” said McGregor. Who will win? Join us at Camden Cocktail Lounge to find out. Camden is the perfect place to be to watch UFC 229 in style and comfort. We offer an unbeatable atmosphere that’s full of opulence and indulgence – no crowded, stuffy sports bar here. Instead, you and your friends can kick back in a distinctive space full of flair and luxury. With bronze accents and charcoal velvets, it’s only suitable that you watch this once-in-a-lifetime match in a place that’s equally as distinctive and memorable. Our innovative food menu will allow your entire party to dine on delicious foods during the match. Take a look at our menu and you’ll see that we offer many of the comfort foods you might enjoy in your sports den at home, but with an upscale twist. Try our Mini Philly Cheese Steak Heroes, which are the perfect size for snacking and sharing. And yes, we make these with real Cheese Whiz for your Philadelphia natives. Of course, our Kung Pao Chicken Meatballs are another great choice. Loaded with flavor and offering just the right amount of kick, they’re a delicious option for your table. Be sure to also try our Mini Sirloin Sliders. Topped with smoked cheddar, caramelized onions, and wild arugula, they’re an upscale bite-sized burger. And no sports gathering is complete without wings. Our Signature Buffalo Tulip Wings come with plenty of blue cheese and fresh veggies and are sure to satisfy your party. When it comes to beer, wine, and cocktails, we have you covered, too. Choose from domestics, imports, and craft beers – we’re sure to have your favorite. Our curated selection of wines gives you plenty of choices, and our cocktails? They’re out of this world. Camden’s cocktails are a little bit different, because they’re created by our talented mixologists. Our cocktails feature some unusual ingredients that may be a little unexpected, but that are also plenty delicious. Their names are just as memorable as their taste, so when you order a Fresh & Easy, a Great Godfather, or a White Tiger, you’ll be able to remember it and order your new favorite drink again next time. Don’t settle for an average sports bar for an event as important as UFC 229. At Camden, we’re equipped with plenty of TVs, comfortable seating, a luxurious atmosphere, and amazing food and drinks. There’s no reason not to join us, so be sure to make your reservations now. We can’t wait to see you on October 6th. Previous PostPrevious Come Try Camden’s Football Menu!